I’ve realized that every meal I’ve made from Chefs Plate has been absolutely amazing. I feel like a chef every time. Learning new techniques and then sitting down to a lovely great tasting meal that actually makes me say ‘mmmm’. Chef’s Plate is one of my favorite local companies. It’s tough because on one hand I absolutely love to cook, I love trying new recipes and learning new techniques. But on the other I never have every single ingredient and the proper step by step instructions. Chefs Plate is always changing and makes me so excited to get in the kitchen to learn new tricks! 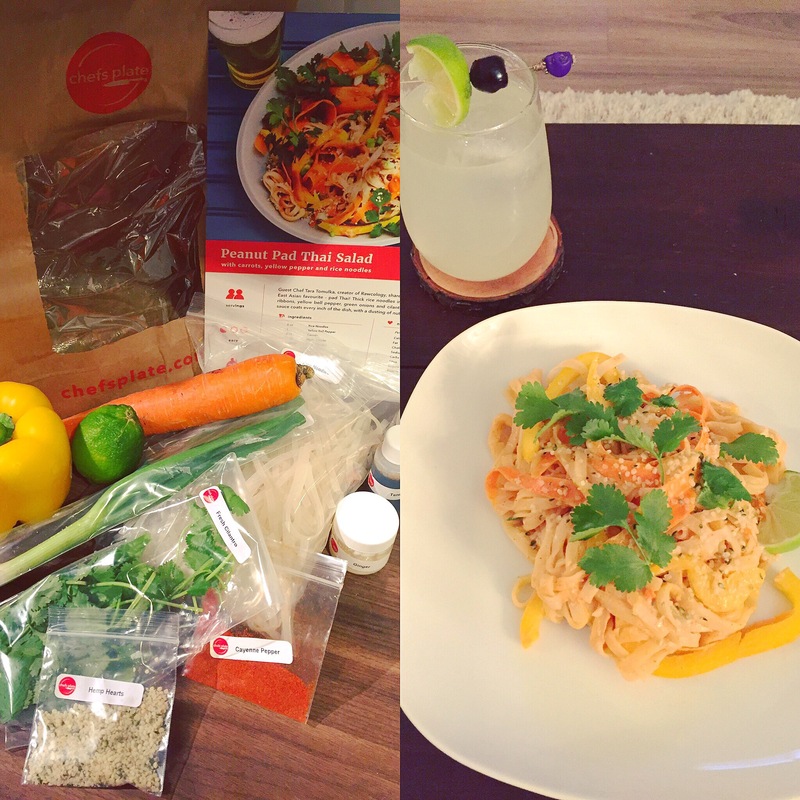 This time around I went for the Pad Thai as this is something I’ve never attempted to make before but have always wanted to try. It was so simple too! Why hadn’t I tried this before? Rice noodles are actually simple to make and I never thought of using carrot ribbons in cooking before! There are so many ways to make Pad Thai too. I’m just happy this recipe was more on the authentic side with ginger, peanut butter, lime and more, rather than some of those Pad Thai’s out there with ketchup, yuck! Although this will never compare to the Pad Thai I had on Koh San Road in Bangkok Thailand, it is still yummy enough to make again and again from home! Wanting to try out some new recipes? Chefs Plate will deliver you full meal recipes and ingredients that are even pre-measured. It is super convenient that they deliver it straight to my work or home, with the fish or meat on ice packs. Not only was it simple and easy to make but it was absolutely delicious! Each week you can choose from 7 meals for 2 people or 4 meals for family sized with menus that are curated by their culinary team and guest chefs. Their meals are healthy, nutritious and they always have so many options ranging from meat, fish, vegetarian, fresh, local and supporting our local farmers! So spend less time grocery shopping and more time in the kitchen with the family cooking for the ones you love!